Sometimes, in the lower leagues, you don’t know much about a club. You see a name in a scoreline or on a table and recognize it, but the depth of understanding isn’t there. That’s because the number of clubs is often too much to handle, even for journalists. That’s why we do this column, to support that connection between club and fan, no matter how far removed by geography and understanding. So today, we’re talking with San Antonio Corinthians, a club with an epic crest and an interesting backstory. Enjoy! Tell us about the history of your club. 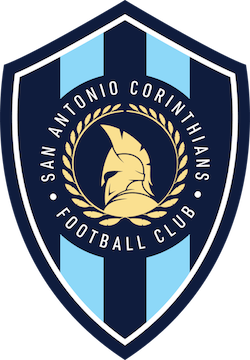 The San Antonio Corinthians Football Club (SACFC) was founded in 2009 and accepted to play their inaugural 2014 season in the National Premier Soccer League (NPSL) in the South Central Conference winning the South Division and finishing third overall in the conference. Your club jumped from the NPSL to the UPSL, can you talk about the differences in the league? We decided on the UPSL due to the growth and competitiveness of the league in recent years. The leagues’ vision of growth and development were vital components in our decision making when joining the league in 2019. The UPSL has welcomed us since day one. We were thankful for the opportunity and how to UPSL National Director, Matt Kahla Jr. assisted in streamlining the membership process. San Antonio now has several clubs, including San Antonio FC, how's the interaction between the clubs? We have great respect for SAFC and all soccer clubs in San Antonio. It’s important for clubs to support one another out of respect for the game and to enhance the development of players all while expanding the game. We did face SAFC back in 2016 and came up short in a hard fought second round US Open Cup match. In a market with other clubs, how does Corinthians stand out? We run our club as a top tier organization. Aspects like discipline, accountability, competitiveness and attention to detail flow throughout. Players and staff are asked to give their absolute best efforts for the club. This season our international friendly matches help set us apart from our cohorts. We will be hosting Club Santos Laguna and Pumas respectively. We are always looking to give our players a competitive edge by challenging them to take their games to the proverbial next level. Big friendly coming up against Santos Laguna, how did that come about and how is your club approaching this match? Our front office and coaching staff have an abundance of international relationships that have been cultivated over the years. Whenever we are able to host events like these it is important the events are beneficial for both clubs and of course fun for our fans! We are approaching this match with the utmost respect for Santos Laguna coupled with excitement. Our style of play and training methods will remain consistent so we can concentrate on what we can control. We are very much aware of the talent we are facing with clubs like Santos Laguna and Pumas. As long as we can execute our game-plan we feel we can compete with any club. Your UPSL regular season has just kicked off, how is the club coming along? What are the goals for this season? We can see the men are starting to gel now that we’ve got some competition instead of just training against each other. Coaches are always analyzing and evaluating players to create the best lineups weekly. We currently stand at 2-1 in our division, with back to back victories. Our goals are to win the national championship and make some noise in the US Open Cup while showcasing local talent. If someone wants to know more about your club, where do they go?